Do your kids have an interest in technology, building robots, coding, creating video games, building websites, photography, digital video, or making amazing Minecraft worlds? Do they want to attend an amazing overnight camp program? Then they will love the summer programs from Fleming Tech Camps at Berkshire School in the picturesque mountain region of New England. Fleming Tech Camps are designed to provide kids with hands-on experiences with cool tech that encourages an interest in science, technology, computing and engineering. We are a 21st century S.T.E.A.M. (Science, Technology, Engineering, Art, and Math) summer camp organization that focuses on giving kids the tools they need to lead successful lives in the digital age. At Fleming Tech Camps we engage your child’s creativity and problem solving skills, and build technology skills that will last a lifetime. To achieve our mission, Fleming Tech Camps partner with schools, museums, universities and summer camps to help those organizations offer state-of-the-art technology programs. This summer, Berkshire School will partner with Fleming Tech Camps to host three amazing summer camp programs. 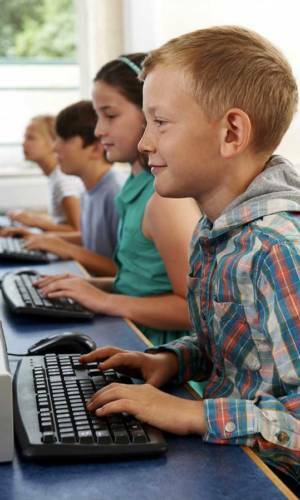 Each session of our technology camps feature a unique, and specialized, technology topic which is lead by an instructor with an expertise in technology and teaching. During camp, the instructor guides campers through an incredibly fun (and educational) journey where campers are learning, discovering, creating and playing with cutting edge tech! In the evenings, campers participate in unique programming run by Berkshire School. Parents can enroll their campers in up to three weeks of Tech Camp at Berkshire School. For families looking for multiple weeks of summer camp programming Berkshire School can offer your family amazing flexibility. You can enroll your child into one, or more, weeks of Fleming Tech Camps and also enroll them into a wide range of other camping programs, including Berkshire School‘s traditional camp programs. What does it take to be an aeronautical explorer? This camp will show you how to rise off the earth and fly through the sky while gaining an understanding of the principles of lift, thrust and control. In this fast-paced flight program you will learn how to build, fly and race quadcopters. Your drone project will provide you with firsthand experience in building and flying your own aerodynamic objects. Before you take to the skies you’ll have hands-on engineering experience learning about your drone’s assembly, best practices on replacing parts and the how to care for your drone when its flying and in storage. Camp will also focus on teaching you how to pilot your drone, FAA regulations and feature a variety of races and flying challenges. Explore the exciting world of Robotics! Working in small teams, learn how to design and build a robot using LEGO® MINDSTORMS®. Program your robot to perform project-oriented tasks and challenges. For novices, start with the basics of construction and programming. For the more experienced, develop sophisticated programming and engineering skills. No prior experience with LEGO® Mindstorms necessary. All skill levels welcome. Learn the foundations of programming in this camp that focuses on developing games and mods. You’ll receive training in Python programming on the Raspberry Pi microcomputer. You’ll utilize your programming skills to build classic games and create new gameplay features and Mods in Minecraft. This camp is recommended for campers who have an interest in engineering and proramming and who are proficient in the use of PCs. Started in 2003 (then known as the VideoGame.Net Experience) Fleming Tech Camp partners with schools, museums, universities and summer camps to provide their campers with state-of-the-art technology and video game summer camp programs. In 2019, we will host over 40 camp programs at 20 locations. Our programs are designed to engage your child’s creativity and problem solving skills, and builds technology skills that will last a lifetime. Fleming Tech Camps focus on providing campers with experiences working with amazing technologies. We provide Introduction, Intermediate and Advanced materials – we have your camper covered no matter your skill level. Many of our campers elect to take our camp programs more then once. Each time they take a camp program they have new experiences with the topics covered and can work on more and more advanced projects as their skill levels increase. Our camps are designed for kids that are highly motivated to learn about technology – about 65% to 75% of the day take place in a classroom. The day is broken up into seven periods. Many of our camp partners offer, an optional, extended AM and PM program so that you can drop off and pick up your camper at a convenient time for you. More then 65% of the day will be spent indoors, working in our technology labs. During the day, our campers are provided with four AM and PM instruction and lab periods. Campers work with subject matter experts and in small teams to build their technology and gaming projects. Weather permitting, everyday our campers will spend time outdoors and play games such as capture the flag, kickball, ‘Nurf War’, and compete in water fights. We will take a few breaks during the camp day – during this free time campers can have a snack and/or play in a video or board game tournament. Many campers buy lunch from our partner schools. Most of our partner campuses offer an optional food service program, and costs for the service differ from campus to campus. If you don’t want to buy lunch, be sure to send a lunch with your child that doesn’t need to be refrigerated. Fleming Tech Camps was at a press conference honoring local Philadelphia schools with educational technology grants. Fleming Tech Camps video is online!